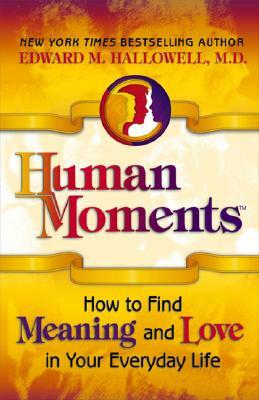 Human Moments is unlike any book available today. Renowned author Edward Hallowell proposes a simple, effective way to find happiness and love in this totally unique guide to living a fulfilling life. Dr. Hallowell teaches us how to recognize and appreciate a "human moment," an instance when we recognize and connect to things that really matter most in life and make it worth living. An engaging storyteller, Hallowell uses his own personal experiences from a traumatic childhood to a prosperous adulthood to illustrate concepts and connect with readers. Skillfully he teaches us how to recognize human moments when they happen, how to savor them, treasure them, and turn them into an enriching experience. Best of all, he reveals how human moments are happening to us all the time-in fact, every day. Hallowell forms each chapter around narratives of intensely moving stories from his own life and embellishes them with personal accounts and reflections from others. He concludes each one with suggestions on "creating connections" in our own lives through which we find true meaning and love. For all those engaged in the ongoing work of personal growth and life enrichment, Human Moments is at once poignant and inspiring, uplifting and endearing-an unforgettable book that will awaken hearts and change lives.